Today has been my bottling day for my Early Autumn Mild. I was still getting the same reading as on Wednesday, of 1.014 although now at 21°C. It takes a long time although most of that work is washing up and sanitising everything that will go near the beer. I also had to work out how much sugar to add. The rough and ready measure of 1 tsp per bottle suggested by the brew kit instructions is too hit and miss. I followed some online instructions from John Palmer and calculated that I needed 60g. I boiled this in about 300ml of water, let it cool for a bit and then poured it into my secondary vat (the boiling serves to ensure that it is sterile). The beer from the fermenting vessel was siphoned into this container, quickly bringing down the temperature gradient and ensuring that the sugar is well mixed with all the “proto-beer”. 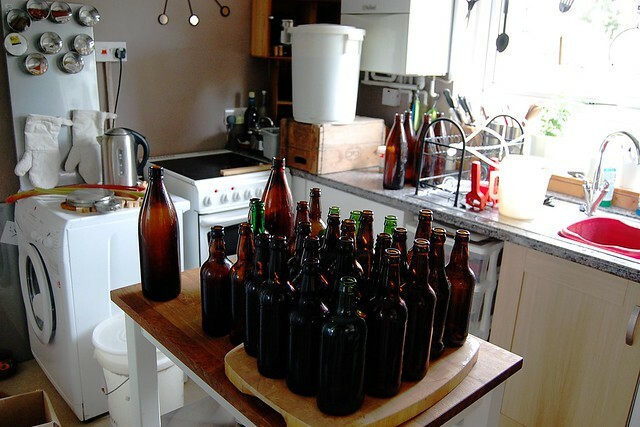 I then siphoned from the secondary vat into the collection of bottles (all sanitised and rinsed beforehand). These bottles will now sit unopened until at least half-way through October. There was some beer left over though, which I couldn’t easily siphon into the last bottle. Instead I used a jug and, rather than sealing this one away, will use it as as cooking ingredient over the next few days. Indeed, it is time to publish this post and go down and move my bread (made with this beer rather than water) onto the next stage.